Today I am showing you another outfit with another dress from Cichic. In contrast to the outfit I showed you 2 days ago which was more casual and wearable in daily life. Today’s dress is more fancy and would look great in an elegant party. I am not a big lover of gold color (I am more of a silver girl), but I definitely love the color of this dress as it looks so warm and rich + I think that the belt is a cherry on top! I ordered this dress from Cichic in size L which is a really unusual size for me ( I am usually size S or M), but as I have experienced it a lot times before you have to really take in account the measurements that are given on the site, that is why I went with size L! The dress fits me really good, though, as I have pretty long legs, I kind of wish that it would have been a bit longer, but otherwise everything was fine! So love the dress! Very vintage but modern at the same time, you look great! The dress is very pretty!! It looks so pretty and great for any summer events, especialy for something like friends wedding. Wow! Amazing dress! You look beautiful! Gorgeous dress and I agree with you the belt is a cherry on the top on the amazing dress. This is so cute! Isn't it so weird how sizing changes? Even at one store I can bring home three dresses in all different sizes, haha! So very stunning! You just look so perfect. The dress is perfect on you! Love the details of your dress! Such a sophisticated and classy look. I'm a big fan of gold and you wear it so beautifully. 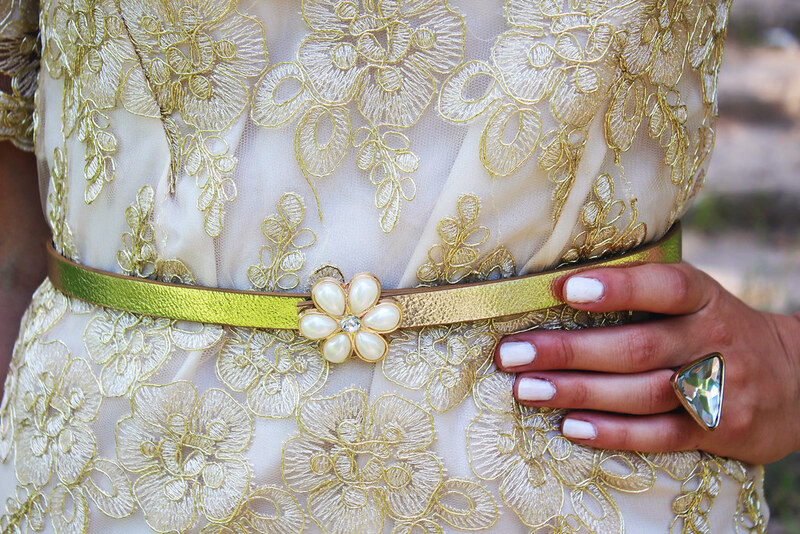 The belt is a fabulous touch – great styling. It looks like I've gotta check out this Cichic site! Pretty and polished indeed – Love this sophisticated and elegant look! The gold color is very flattering on you (despite your partiality to silver). Gorgeous! Hi Mandy, I love the way you have done your hair. This dress looks amazing on you. Even I am a silver person. But lately, I am drawn to golden watches and dresses. They look nice. You look like a princess in this gorgeous gold and lace. I love the addition of that sweet belt and I am crazy about that stunning statement necklace! Pretty & polished…..you are truly rocking this super duper lovely lace dress! Love everything else you put together with it!! !